Digital media, wireless pay terminals, and fuel cell technology -- sounds like the ingredients for a plot to take over the world, or, at the very least, the stuff that will dominate high-tech headlines in the coming days. The five companies behind these technologies will loom large in the news this week. Here's what to watch. The DVD rental king took bold steps to increase its online video empire yesterday when it officially unveiled its Watch Instantly service in Latin America. In a blog post, Netflix vice president Rochelle King said 43 new countries would be fully covered by Sept. 12. Brazil's 194 million residents are eligible for service now. It remains to be seen whether the expansion will bring back the bulls. 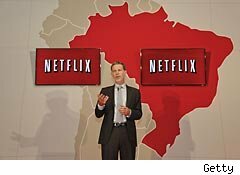 Shares of Netflix fell more than 10% in last Friday's intraday trading after movie partner Liberty Starz (LSTZA) said it wouldn't re-up its distribution agreement. CEO Reed Hastings tried to calm frayed nerves by pointing out that Starz accounts for just 8% of domestic traffic, but so far the bears are still biting and the stock is down. Photoshop enthusiasts unite! Adobe takes the stage -- literally -- tomorrow through Friday in Las Vegas for the annual Photoshop World conference. Billed as the largest "digital photography and lighting conference," the show is nevertheless confined to the Mandalay Bay hotel and is unlikely to be anywhere near the scale of January's Consumer Electronics Show. Yet it is important. Adobe counts Photoshop among its signature products, while management has been candid about getting its entire Creative Suite of applications (including Photoshop) into the hands of creators who use tablets. Don't be surprised if the conference includes allusions to, if not outright announcements about, Adobe providing additional tablet support. We'll get clues to how far we've progressed in realizing Google's (GOOG) goal of a wallet in every Android handset when VeriFone reports earnings after the bell today. VeriFone is best known for making credit card readers. Lately, the company has been trying to replace the swipe with a wave -- as in, waving a smartphone near the terminal to pick up a secure near-field communications (NFC) signal for processing transactions wirelessly. Smartphone manufacturers are working to include the necessary chips inside all new handsets. Rumors say the iPhone could get NFC capability when version 5 of the handset ships no later than next spring. In the meantime, analysts expect VeriFone to grow profits 27.8%, to $0.46 a share, on a 14.5% gain in revenue, to $299.4 million, in the fiscal third quarter completed in July. We'll also get a closer look at how committed major industries are to going green when FuelCell Energy reports earnings after the bell today. The company makes a range of power plants that use clean fuel cells for baseline power generation for private facilities such as universities and hospitals. Analysts expect substantial progress in the company's fiscal third quarter, calling for last year's $0.15-per-share loss to fall to $0.09 on a 53.1% surge in revenue. Investors should also watch for progress in producing cash from operations. It's been 11 years since FuelCell Energy last squeezed even a dime from the underlying business. Fuel cells are also making their way into cars. Or at least that's what Quantum Fuel Systems would like us to believe. The company has a long history of providing alternative fuel tech to the auto industry, yet profits have proven elusive. Wall Street doesn't yet believe the story. They're too busy following other stocks. Only one analyst firm follows the stock and the last published rating came more than two years ago, when Thomas Weisel rated the stock "overweight." The implication? If not for the Obama administration's emphasis on fuel economy, we wouldn't even be talking about this stock. Don't expect Wall Street to pay attention unless tomorrow's earnings report reveals massive revenue growth, igniting hope that a long string of losses is finally nearing its end. And that's the week to come. What stocks are you following right now? Please weigh in using the comments box below. You can also click here to send Tim an email with your suggestions. Motley Fool contributor Tim Beyers is a member of the Motley Fool Rule Breakers stock-picking team. He owned shares of Google at the time of publication. Check out Tim's portfolio holdings and Fool.com writings, or connect with him on Google+ or Twitter, where he goes by @milehighfool.The Motley Fool owns shares of Google. Motley Fool newsletter services have recommended buying shares of Google, Adobe Systems, and Netflix. Motley Fool newsletter services have recommended creating a diagonal call position in Adobe Systems. Motley Fool newsletter services have recommended buying puts in Netflix.